We gained new members this year from Malaysia, Uruguay and the United States and we welcomed new members to the CHI board of directors from Ireland, the UK and Malaysia. This summer, the CHI board had the pleasure of meeting our colleagues at ABZ in Zurich, Switzerland and visiting the innovative and energy-efficient co-operative housing community in the Hunziker area of Zurich. 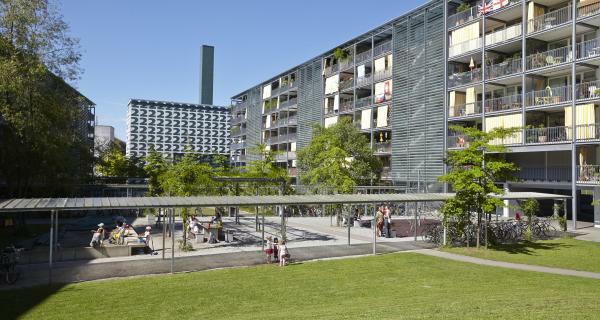 ABZ is the largest housing co-operative in Switzerland with 60 housing communities in and around Zurich and more than 10,000 residents. We developed a first strategic plan for CHI and aligned our strategic and action plans to the Blueprint for a Co-operative Decade. This included the development of a Blueprint Interpretation for Co-operative Housing. Some housing sectors within the Alliance continue to struggle to secure enabling legal frameworks for co-operative housing development and sustainability in both developed and developing countries. There is a lack of understanding in different global regions of the role co-op housing can play in addressing shelter challenges and relieving housing poverty. Access to development capital for co-op housing, especially affordable co-op housing, is inconsistent and in many regions scarce or non-existent. CHI sees growth in global membership as key to strengthening the reach and understanding of co-operative housing solutions. We want to continue to develop awareness of housing co-ops as a viable solution to affordable housing and community building. We hope to ally ourselves more strongly with other values-based housing movements, and collaborate more closely with other business sectors within the Alliance. We want to continue developing our communications capacity through the CHI website and social media. The lowlight for the year for Co-operative Housing Ireland was the announcement in the autumn that 1,500 Irish children are now living in emergency accommodation including hotels and bed and breakfast accommodation. They are among the 7,500 Irish people who are currently homeless. These are among the most stark figures illustrating an ongoing Irish housing crisis. Research carried out by the co-operative confirmed this picture with half of Dublin tenants concerned about losing their homes. Against this stark backdrop, the highlight of the year was the launch of a new strategy for Co-operative Housing Ireland in the early months of 2015. The strategy was developed in consultation with members and with fellow co-operators from the global movement. The strategy positions the organisation for major growth in response to the housing crisis. Over the years to 2020 they aim to increase the size of their housing stock by my more than 80 per cent. Already in 2015 they have opened a new co-operative society in the south east of the country. At the same time, they are renewing their co-operative governance to ensure that democratic representation remains at the core of a growing movement. They have also highlighted the co-operative core of their identity by changing the name of the organisation from NABCO to Co-operative Housing Ireland.